Cities Connection Project | 85 DWELLINGS FOR ELDERLY. BARCELONA. 85 DWELLINGS FOR ELDERLY. BARCELONA. 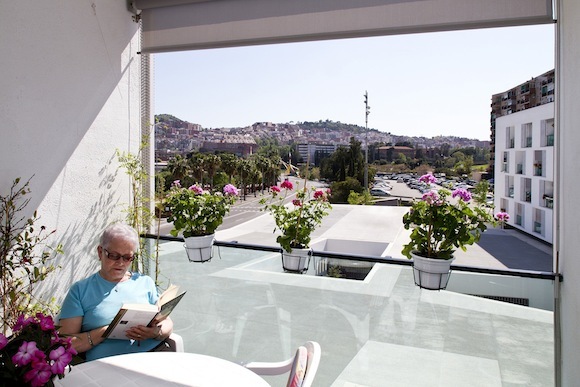 The mixed program of housing and facilities was determined by high economic restrictions that obliged us to maximize the best part of the site: the spectacular views of Barcelona and the ocean beyond. Orientation and topography defined the initial design. Facilities resolve the topographic jump and become a platform from which the south-facing housing units rise in an L-shape. Taking advantage of the Mediterranean climate, each unit is provided with a large terrace that organizes the program of the space. 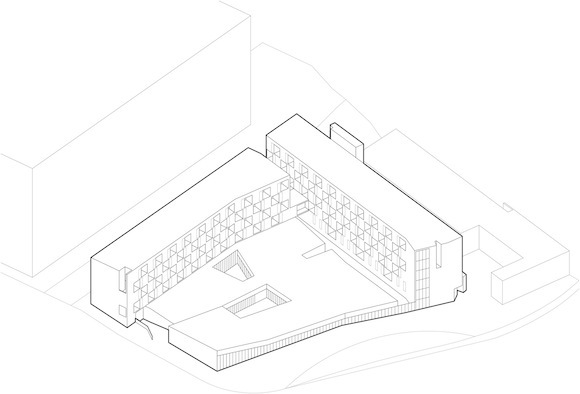 This terrace is understood as an empty space, an excavation of the white mass of the building volume. Its size exceeds the scale of the apartment inside and establishes direct dialogue with the rest of the building as well as the city. The units alternate floor to floor, thus forming across the façade a staggered chessboard pattern of white and black that cloaks the building in a distinctive texture. These terraces condense the life inhabiting them. They expose the domestic activities of the users to the city beyond, like the central courtyard of the houses of the Algerian Kashba translated onto the vertical plane. Each user makes the space their own. The collection of actions and activities of the inhabitants remains integrated in the volume of the building through the interior position of the terrace. The architecture is saturated with daily life, and shows itself to the city as such. White covers everything, from the individual curtains to the façade as a whole, unifying the building like the snow on the distant horizon.